In the world of design, very few artists and designers have achieved combining form and function. It’s probably because marrying these two elements would entail not only having a design that is aesthetically pleasing to the viewer but also something that adds value to its user, both of which are extremely hard to incorporate even on their own. So it is truly amazing when one artist manages to pull off a work of art that’s both beautiful and useful. One particular artist who has achieved this status is Chicago-born Chuck Anderson. If you’re not familiar with this person, you might have already seen his art without you knowing it, especially if you have a computer that runs on Windows 7. Anderson can already be considered a veteran in graphic design, with an impressive portfolio that showcases his work with clients such as Microsoft, Nike, Warner Bros., Reebok, Burton and target to name a few. He has also worked with various non-profit organizations including Invisible Children, charity:water and wordMadeFlesh. His latest design project is with a furniture design company called turnstone. To be specific, Chuck Anderson has transformed the company’s Campfire Paper Table into a one-of-a-kind work of art that is both functional and at the same time very artistic. 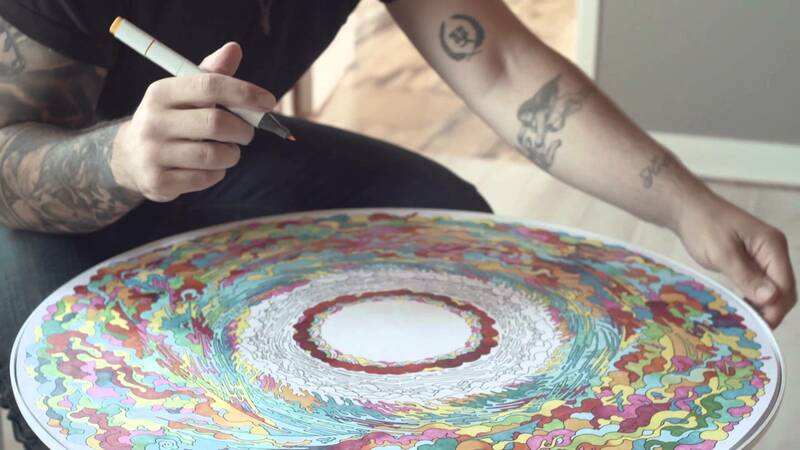 Here’s a short video about Chuck Anderson’s work with Turnstone’s paper table. For those interested in Chuck Anderson’s amazing paper table, you can check out Turnstone’s website and order either a fracture or print reproduction of the table. As an added bonus, Turnstone is also making available the different tools and inspiration used by Anderson in creating the table such as the copic markers, action method cards and the MoMA numbers clock found in his office. So there you have it guys. What do you think of Chuck Anderson’s Paper table? Tell us by leaving a comment below. For more design news and inspiration, add us up on Facebook, Twitter and Google Plus. You can also subscribe to our blog for more design updates.